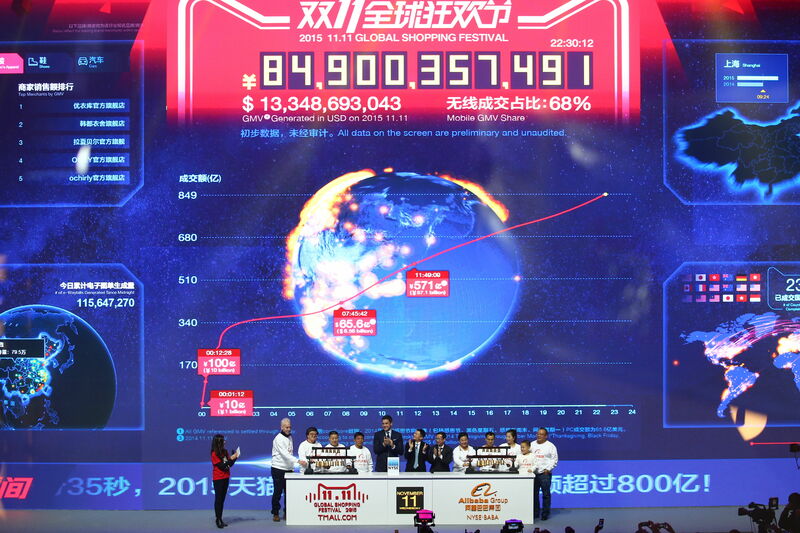 Alibaba Group rang New York Stock Exchange opening bell to celebrate the 2015 11.11 Global Shopping Festival remotely from the Water Cube in Beijing. 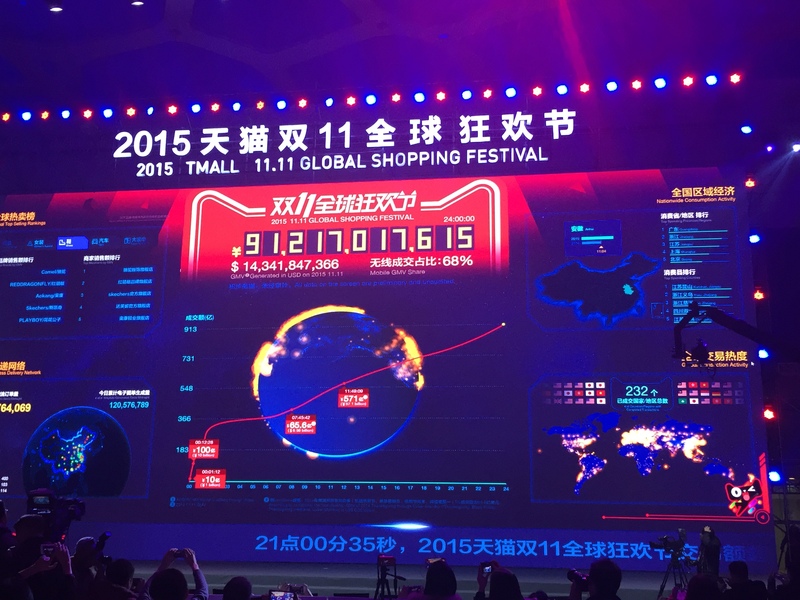 Alibaba Group generated USD14.3 billion (RMB91.2 billion) of GMV during the 2015 11.11 Global Shopping Festival. Beijing, November 12, 2015 – Alibaba Group Holding Limited (NYSE: BABA) today announced that USD14.3 billion (RMB91.2 billion) of gross merchandise volume ("GMV") was settled through Alipay on Alibaba's retail marketplaces on November 11, 2015, making the 2015 11.11 Global Shopping Festival the largest shopping day in history. Mobile GMV settled through Alipay accounted for 68.7 percent of total GMV. "This day demonstrates the power of domestic China consumption, and the Chinese consumer's strong demand for international products," said Daniel Zhang, chief executive officer of Alibaba Group. "It also showcases how Alibaba uses big data, cloud computing and mobile innovations to create the best shopping experience for buyers and sellers." Total mobile GMV settled through Alipay was approximately USD9.8 billion (RMB62.6 billion), exceeding total GMV in 2014, and accounted for 68.7 percent of total GMV. Total mobile GMV increased by 158 percent compared to 2014. Total number of mobile buyers on Tmall.com and Taobao Marketplace was 95 million. Alipay processed a total of 710 million payment transactions, and processed 85,900 transactions per second at peak. AliCloud processed a total of 140,000 transactions per second at peak. In addition, Alibaba's logistics partner and affiliate, Cainiao Logistics, received 467 million delivery orders during the 24-hour shopping period, more than 15 times the daily average of 30 million orders, and representing a 68 percent year-over-year increase from 278 million orders in 2014 11.11. Cainiao Logistics also generated more than 120 million e-waybills, a system created by Cainiao Logistics that shares shipping information among delivery firms, customers and merchants. As the facilitator of an ecosystem with 386 million annual active buyers, Alibaba manages the high volume of orders and packages through a robust partnership of logistics networks and delivery companies. The company also leverages proprietary data management applications and forecasting systems to ensure the delivery of hundreds of millions of packages across China and around the world. For additional content from the event, please follow the Alibaba Group official Twitter account at www.twitter.com/AlibabaGroup, visit corporate news blog Alizila, or go to www.alibabagroup.com/en/ir/home. 1 Alibaba Group's operating results disclosed in this press release are denominated in RMB; year-over-year comparisons and growth rates are calculated on the basis of RMB amounts and are not affected by foreign exchange rate fluctuations.